A two-character World War Two drama, Heaven Knows, Mr. Allison deftly explores themes of survival, companionship and the potential for impossible love when two strangers find their fate tied together. It's 1944 in the South Pacific, and after a mission gone bad U.S. Marine Corporal Allison (Robert Mitchum) drifts alone in a raft, washing up at a seemingly abandoned fishing village on a remote island. He finds Sister Angela (Deborah Kerr) all alone, and she explains that the villagers had fled or were forcibly recruited to the Japanese army, while the clergyman who ran the church has recently died. Allison and Angela explore the island and consider building a raft to sail towards civilization. But these plans are disrupted by a bombing raid followed by the arrival of Japanese troops to set up a weather station. Instead, the nun and the Marine have to confine themselves to a cave to avoid getting captured. When food begins to run short, Allison has to risk a raid into the Japanese camp to find supplies. With the passing days, Allison develops feelings towards Angela, and they discuss her vows and their surprisingly similar devotion to two separate causes. But the war rages on, and they have to face increasing danger from larger concentrations of troops landing on their little island. Sharing some basic plot elements with The African Queen (1951), director John Huston goes back to the theme of two fundamentally incompatible characters thrust together under extreme stress. The hostile jungle and serpentine river environments are replaced by a more docile South Pacific island, but Heaven Knows, Mr. Allison enjoys more sharply defined characters and career choices to play with. 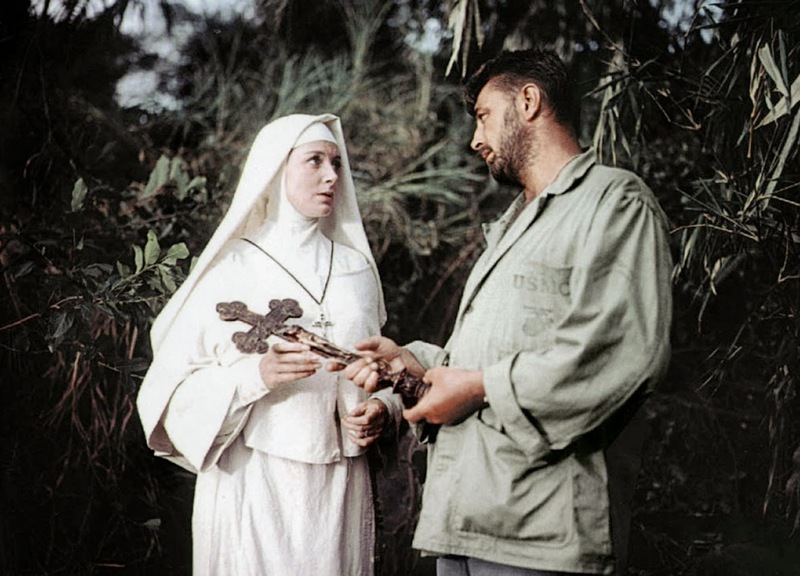 The conflicts and commonalities between a nun and a Marine make up the heart of the film, and Huston, who co-wrote the script with John Lee Mahin based on the Charles Shaw novel, elegantly probes the cultures that produced Sister Angela and Corporal Allison. Dedication to duty, a strict code of conduct, and unwavering belief in the cause are common to both, and apart from one drunken slip by Allison, the two survive the ordeal thanks to a strict adherence to the principles of their chosen lives. Huston keeps the movie well balanced between relationship development and the dangers posed by the war. As Angela and Allison negotiate their strange life together, their habitat is constantly evolving. Isolation is followed by bombing, the establishment of a Japanese weather station, a distant naval battle, more isolation, then occupation by a full contingent of Japanese soldiers. The cave becomes a sanctuary, forcing Angela and Allison to become physically closer and challenging their boundaries. Mitchum and Kerr are both excellent. Effectively in every scene, this is one of Mitchum's more engaging performances, as he displays a range of honest emotions often not required in most of his other roles. Kerr is more secretive as Sister Angela, hidden from head to toe in her habit. Kerr allows Angela to be a sweet but complex puzzle for Allison to assemble, from her unexpected presence on an isolated island to her decision to become a nun. The film takes no easy shortcuts, and finds a gracious ending that leaves room for open questions. Of course, the answer to what happens next is Heaven Knows, Mr. Allison.